The national –conservative Law and Justice (PiS) party prevailed in the October 2015 elections gaining 235 out of 460 seats in parliament. Immediately after its inauguration the new PiS-administration launched some controversial policy initiatives, such as seizing direct control of the state broadcasting channels and the security services, and purging the heads of state-owned companies. A major issue are attempts to curb the independence of the judiciary by imposing political control over courts and the appointment of judges. 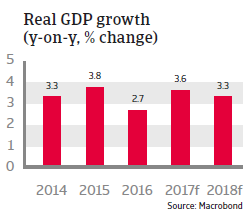 After a moderate slowdown in 2016, Polish GDP growth is expected to increase again above 3% in 2017 and 2018, due to robust consumer demand, rising business investment and increased investments linked to EU funding. 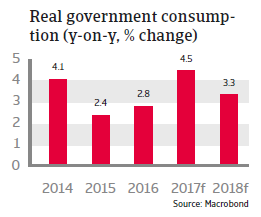 Private consumption is expected to increase 4.5% in 2017 and 3.4% in 2018, underpinned by increasing employment, rising wages and social transfers. Investments are supported by a strong business sentiment and low interest rates. 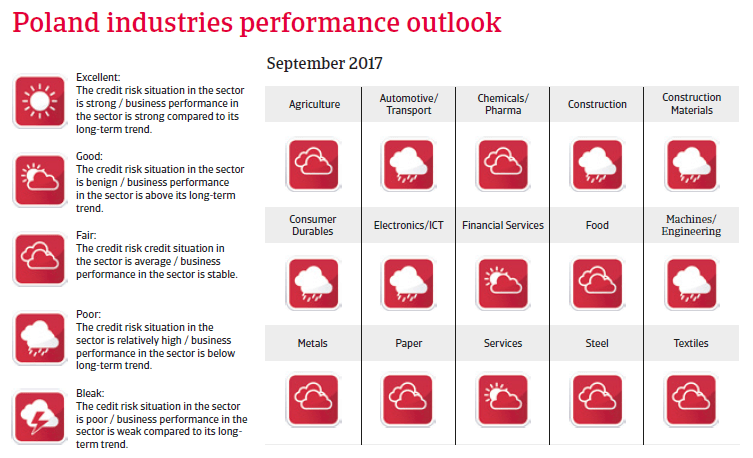 Export growth is expected to remain buoyant. Following deflation in 2015 and 2016, consumer prices have started to grow again this year, and are forecast to increase 1.8% in 2017 and 2.2% in 2018. The government’s fiscal easing widened the deficit to 2.5% of GDP in 2016, which is expected to increase further in 2017 due to increased social spending and public investment. Policies focused on increasing child benefits and investment are mostly funded by new taxes on banks and better tax collection. Under pressure, the government has already stepped back on some promises such as watering down its mortgage relief plan. This should ensure that the country does not re-enter the EU excessive deficit procedure in 2017-2018. Public debt is moderate around 45% of GDP. The Polish banking sector is stable, well-capitalized, liquid and profitable. However, banks are exposed to foreign exchange risk as more than 30% of housing loans are denominated in Swiss francs. Government policies to convert franc-denominated mortgages into zloty should help to ease this risk without significantly hurting bank profits or credit growth. 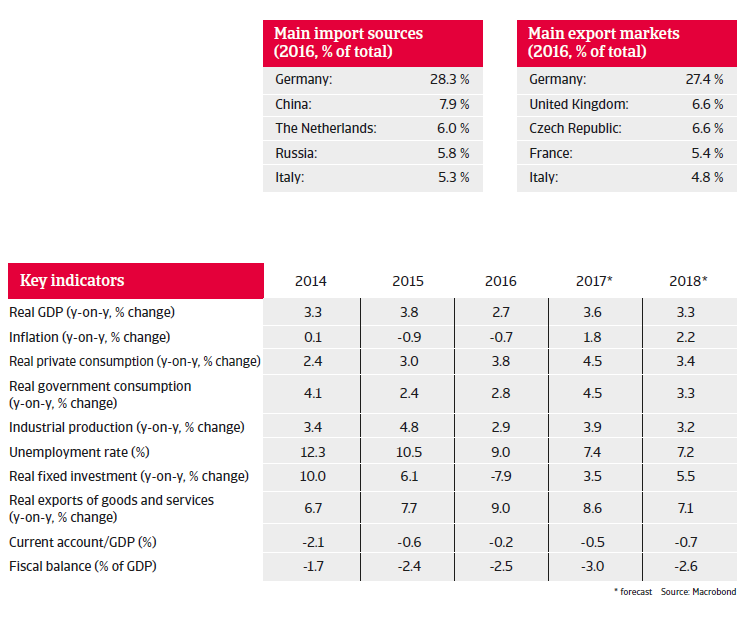 Poland remains vulnerable to international investor sentiment. Together with external factors like the Brexit decision and uncertainty over US policy direction, concerns over adverse economic and domestic policies by the Polish government have led to increased currency volatility and higher sovereign bond yields in 2016. Poland´s external financing requirement in 2017 is high, at 83% of its international reserves and structural current account deficits have contributed to a relatively high external debt ratio of around 70% of GDP. 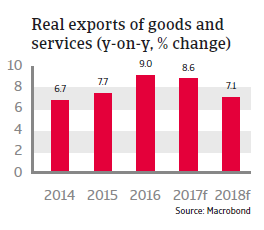 That said, risks to Poland’s external economic stability are largely mitigated by international reserves covering more than five months of goods and services imports. The country also has access to an IMF precautionary line in case of emergency. A large share of external debt is in intercompany loans, mitigating refinancing risk.